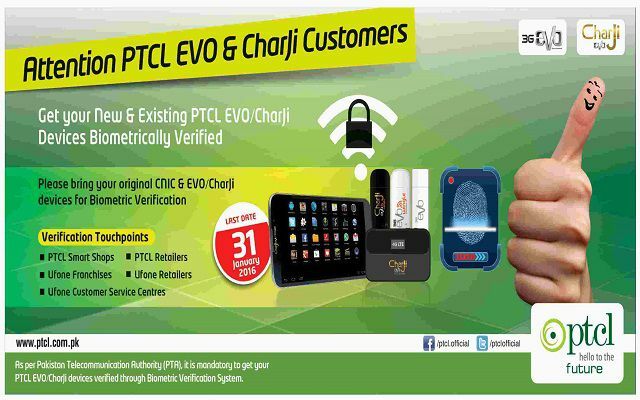 As per the directions of Pakistan Telecommunication Authority (PTA), all EVO & CharJi users are required to biometrically authenticate their devices. This is an obligatory requirement that applies to both present and new subscribers. Customers can biometrically verify their devices by visiting any of the following touch-points, along with their original CNIC & device. Customers should visit nearby touch-points. They will present their fingerprint impression for biometric verification and provide MDN (or ICCID) with Original CNIC. If subscribers are unaware of their MDN’s they can just text their ESN (Electronic Serial Number – an 8 digit alpha-numeric code present on devices) to 0512181218 to receive their device MDN. Subscribers will receive an SMS notification upon successful biometric verification of their devices. ESN DD726911 (Space after ESN) à 0512181218 (Standard SMS charges will be applicable). BVS is compulsory and applies the whole EVO Wireless base i.e EVO 3.1 USB, EVO 3.1 Cloud, EVO TAB, EVO Wingle, Nitro USB, Nitro Cloud, CharJi Wingle,CharJi Cloud & CharJi Tab subscribers. The BVS touch points will also facilitate subscribers requiring change of possession for EVO wireless devices. The deadline for Biometric verification is the 31st of January, 2016. All EVO & CharJi subscribers should verify their ownership before this date to evade disconnection of services.